Last night was the opening of the Orange Art Gallery. It was an awesome night with hundreds of people coming through the exhibit and the new building. It was so exciting to see and hear people's reactions to my work. Most people were not familiar with my medium so there were lots of questions. What I always enjoy is how people connect with the sculptures. Often they see something familiar in the face - sparking a memory of someone they love. There is often an emotional response - mostly smiles and laughter, ocassionally tears. People always share these memories or stories which often leads to ideas for my next sculpture. For an artist there is nothing more satisfying that seeing your audience connect with the art. 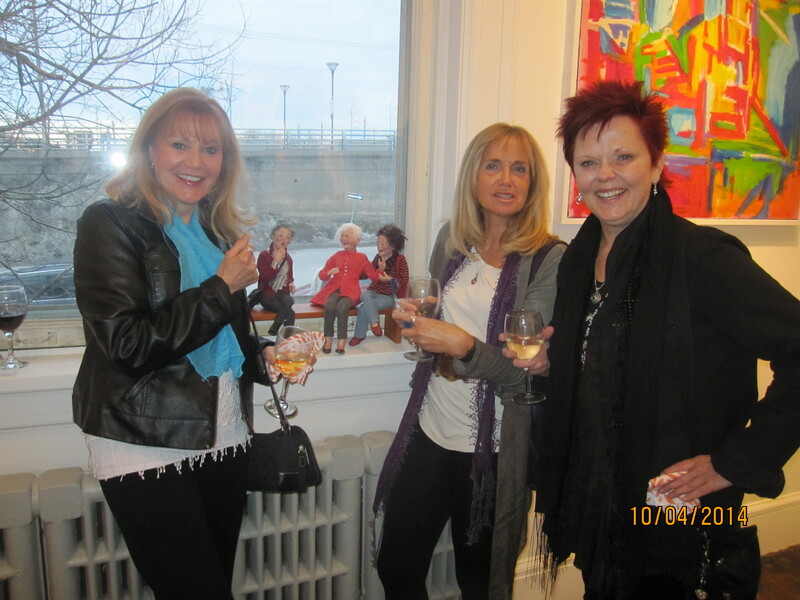 At the Orange Gallery opening, these three friends connected with "Gossip in the Park" . They saw themselves right down to hair colour and how they dressed. The lady on the left is a school teacher and she entertains her friends with stories about her students all the time. They recognized themselves and to my delight, reinforced what I was trying to capture in the piece. Friendship . . . hanging out with your girlfriends . . . laughter . . . Life's simple pleasures. Add a little wine, like these ladies did, and it's a perfect night. This man attended a demonstration I gave last weekend. I was sculpting a head and he was watching. Suddenly people around us starting pointing out how much they looked alike. He was a great sport, hammed it up and let me take a picture. 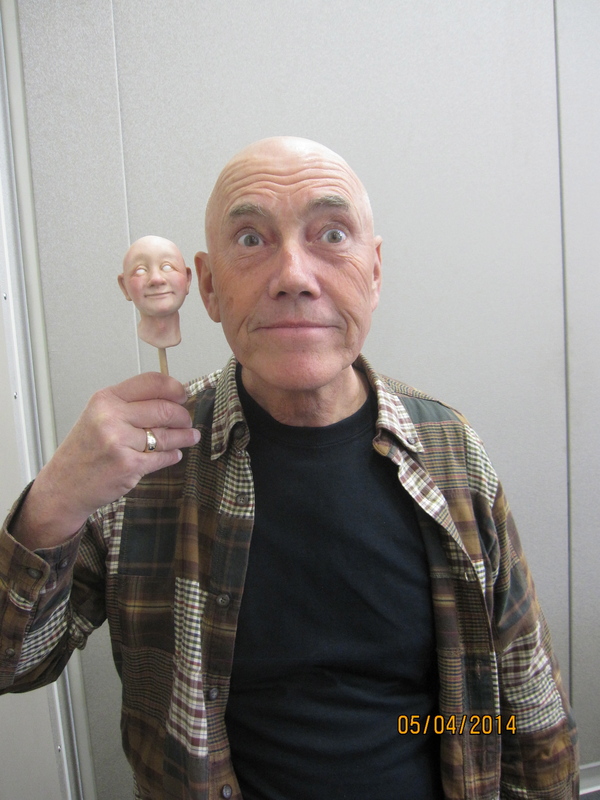 People often ask me if I model my sculptures after anyone in particular. The answer is always yes and no. Subconsciously I think certain features keep popping up from my own memories or from people I know. Sometimes I meet someone who's features strike me and sometimes it's deliberate. A recent submission into an International Open Call for Artists resulted in Maria Saracino being selected as one of three Art Masters for the month of March 2014. "Warm, vulnerable and touching - insisting on staying human . . . "
Check out the Gallery For.Me, online Art Gallery. Take a look at the pages "Art Master This Month", "News" and "Digital Files of Artists"
Figureworks curates a juried annual award shows in Ottawa, Canada. Both national and international artists who work with the human form as their subject matter are welcome to participate. All media are accepted. Maria Saracino’s piece “The Bath” has been accepted into the show and will be part of an exhibit with over 50 figurative works. ‘Figureworks 2013′ is the fourth annual juried Figureworks award show. It takes place at Saint Brigid’s Centre for the Arts, 302 St.Patrick street (entrance on Cumberland street), Ottawa, from November 19 till December 1, 2013. The vernissage will take place on November 19, from 6-10 pm, with the award ceremony at 7.30 pm. Figureworks aims to provide an opportunity to celebrate the visual art of the human form. The organization puts the spotlight on artists, their works and the life models, which are essential to nurture their creativity and whose profession is an art on itself. Many, many thanks to everyone who supported me by voting in the Easter Seals campaign. Easter Seals set a goal of 3,500 votes. They surpassed this goal with close to 9,000 votes, thanks in part to all of you. The winner of the public vote is Sandra Westmoreland with her lily, “Sunny Day”. Even though I didn’t get the public vote, my illustration will be appearing on an Easter Seals stamp. I’m thrilled to be in the company of these other artists and I’m excited for the release of the six winning stamps. Look for my “Orange Burst” in your Easter Seals envelope in the Spring of 2014. Thanks again to everyone who voted – this was a fun experience! ﻿Award winning artist Maria Saracino announced today that her acrylic illustration “Orange Burst” was chosen as an Easter Seals Stamp for the 2014 Easter Seals Campaign. Maria Saracino is a multi-media artist who is known for her figurative one-of-a-kind polymer clay sculpture and more recent polymer on stone relief sculpting. Maria Saracino’s “Orange Burst” was chosen through the Easter Seals annual art competition. Six winning artwork designs were selected and will be featured on the 2014 Easter Seals Stamps. Artists from the United States, Canada and Australia competed in this event. The six winning artists will be featured on a stamp that will be distributed to over 19 million homes in their spring campaign. The six stamps will also be promoted on their website in a public competition to pick the Easter Seals Stamp of the Year. The winning stamp will be featured on blankets and other premiums throughout the year to raise money for people with disabilities. The competition starts October 24th and the winner will be announced on November 4th. The public is able to vote on the Easter Seals homepage, Facebook or Twitter pages. Easter Seals, founded in 1919, is a non-profit organization, which provides programs, and services to help children and adults with disabilities achieve independence. Since 1934, Easter Seals has been using decorative stamps to raise money and create awareness of its programs. Over the years, the stamps have transformed into the organization's logo -- the lily -- and have come to be known as Easter seals. Today, over 19 million households nationwide receive the organization's seals each spring.